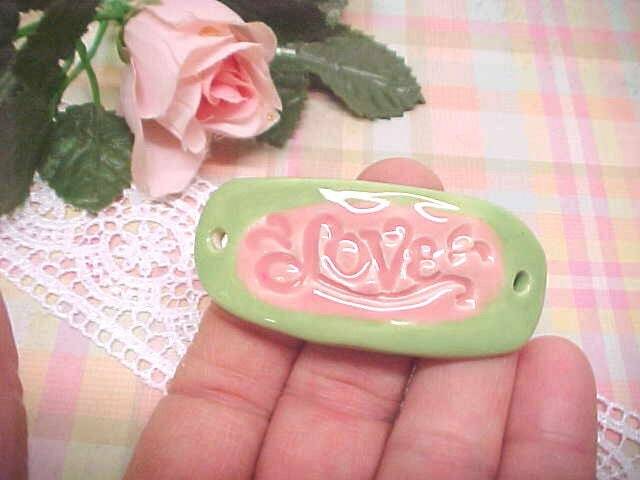 This Pink & Sage Green DIY bracelet connector has LOVE stamped in the Pink part, Sage Green glaze everywhere else. I made this of Porcelain clay. The back is also glazed. It made it curve slightly to fit a wrist & has 3 tiny marks on back where the kiln stilt touched. I have sanded them smooth. 🎀 SIZE: This pottery pendant measures 2 1/2 inches long & a little over 1 inch wide, maybe 1 1/16 inches wide. About 1/8 inch thick porcelain. A small hole in each end will allow for jump rings, thin leather cords, etc., to craft your bracelet. Contact me with any questions! I'm convo-friendly!